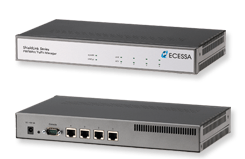 Bringing a security and WAN link control solution to the SME market, Ecessa (formerly Astrocom) reportedly announced its new product family of affordable WAN Link Controllers. According to the company, the new ShieldLink family – including the ShieldLink 100 model, pictured below – provides enhanced flexibility in defining access control. Companies always look for reliable security products that can protect the sensitive data exchanged on their networks. At the same time, this slower economy has reduced the budget available for network security. The emphasis has been shifted to products that meet the security requirements at an affordable cost. The Ecessa solution allows the companies to manage Internet traffic and maintain websites more effectively as its features are integrated in one network device to provide greater functionality and reliability. By offering enhanced flexibility in defining access control, ShieldLink’s integrated firewall enhances access to networks with new security feature sets. To handle a variety of network traffic zones, ShieldLink defines three classes (WANs, DMZ and LANs) of network interfaces. It also regulates the flow of traffic within determined zones by preventing network intrusion to private networks by inspecting traffic passing through it (both inbound and outbound). ShieldLink also provides other features such as distributing traffic among multiple, diverse network links and link aggregation (multi-homing); automated inbound and outbound load balancing and failover; site failover and fallback, redundancy, and traffic shaping. Ecessa used to be called Astrocom. The company changed its name recently and appointed Marc Goodman as its new marketing director to lead all corporate and product marketing efforts. According to the company, Ecessa comes from the word Necessary, which incorporates the key concept of the necessary technology for reliable and fast WAN infrastructure vital for business continuity.